Germ cell tumors may be distinguished by their line of differentiation. Primitive, unipotential germ cells are the precursors to ovarian dysgerminomas and their testicular analogue, the seminoma. However, pleuripotential germ cells diverge along several lines of differentiation: trophoblasts, choriocarcinoma; embryonic cells, embryonal carcinoma; extraembryonic components (endoderm, mesoderm, ectoderm), teratoma; presomite embryoid bodies, polyembryoma; and yolk sac, yolk sac (endodermal sinus) tumor. Dysgerminomas are the most common malignant germ cell tumor occurring in the ovary (see the following image), and these lesions are found most commonly in adolescents and young adults; in fact, approximately 60% of cases are diagnosed in patients younger than 20 years. Common signs and symptoms of ovarian dysgerminomas include abdominal/pelvic pain (55-85%), abdominal mass (35%), fever (10-25%), vaginal bleeding (10%), and, occasionally, ascites. Unlike other germ cell tumors, dysgerminomas often occur bilaterally (approximately 10-20% of cases). 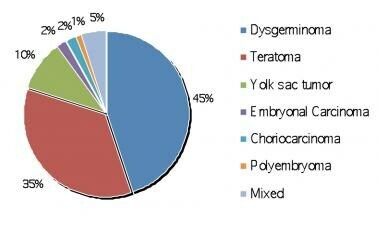 and percentages of malignant germ cell tumors. Go to Ovarian Cancer and Borderline Ovarian Cancer for complete information on these topics. Yolk sac tumor may exhibit a solid pattern, simulating dysgerminoma, but other classic architectural patterns of yolk sac tumor (ie, reticular, microcystic, glandular, or Schiller-Duvall bodies) are also invariably present. Pure embryonal carcinoma is rare in the ovary. However, mixed germ cell tumors occur in approximately 5% of cases. When present, embryonal cell carcinoma exhibits more nuclear hyperchromasia and nuclear pleomorphism, amphophilic cytoplasm, high mitotic index, and necrosis. Often, a glandular or papillary architecture is present. The cells of embryonal carcinoma express CD30 and cytokeratin (strong, diffuse), whereas those of dysgerminoma do not. Sertoli cell tumors may be mistaken for dysgerminoma when tubules are indistinct and/or solid, especially if they are poorly fixed. However, Sertoli cell tumors do not usually have a background lymphocytic infiltrate; they express cytokeratin (strong, diffuse), calretinin, and inhibin. Dysgerminomas are associated with elevated serum levels of lactate dehydrogenase (LDH). Although these tumors are thought to be hormonally inert, at least 1 case of precocious puberty occurring in association with dysgerminoma has been reported. The patient was a 6-year-old girl whose precocious puberty was caused by elevations in the levels of beta–human chorionic gonadotropin (beta-hCG), alpha-fetoprotein (AFP), and estradiol. Go to Gynecologic Tumor Markers for complete information on this topic. Dysgerminomas are characterized by their solid nature and rapid growth. Grossly, these tumors often measure more than 10 cm in maximum dimension at the time of diagnosis. The classic histology of dysgerminomas features a proliferation of epithelioid cells admixed with mature lymphocytes arranged in sheets or small clusters separated by thin, fibrous septae resembling alveoli. The neoplastic cells are large and have moderate to high nucleus-to-cytoplasm ratios. Other features are squared-off to round nuclei; vesicular chromatin; prominent nucleoli; clear to eosinophilic cytoplasm rich in glycogen and lipid; and distinct cell borders. Multinucleated forms may be present. Mitotic activity may be significant and may vary greatly, even within the same tumor; atypical mitoses may be seen. Noncaseating granulomas, syncytiotrophoblastlike giant cells, and germinal center formation are not uncommon. Additionally, foci of hemorrhage, necrosis, and small microcalcifications may also be identified. Examples of ovarian dysgerminoma histology are shown below. Ovarian dysgerminoma histology. The arrows indicate syncytiotrophoblastlike giant cells. A and B: Hematoxylin-eosin, ×200. C: hematoxylin-eosin, ×400. D: hematoxylin-eosin, ×600. Although numerous architectural variants exist, the cytologic features remain constant. These varying architectural patterns include but are not limited to sparse lymphocytes, trabeculae, microcysts, and tubules, as well as extensive hyalinization. As yet, no prognostic significance has been attributed to these architectural patterns. Dysgerminomas demonstrate a characteristic tigroid background and loosely cohesive, polygonal cells with round to oval nuclei, vesicular chromatin, and multiple (1-4) distinct nucleoli on cytology preparations. 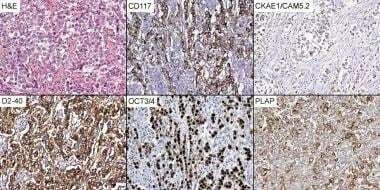 The neoplastic cells of dysgerminomas express placental alkaline phosphatase (PLAP), CD117 (c-kit), OCT 3/4, SALL4, and, variably, cytokeratin (see the images below). They do not express epithelial membrane antigen (EMA), S100 protein, CD45 (LCA), or alpha-fetoprotein (AFP). Dysgerminoma immunohistochemistry (x200). CD117 = a proto-oncogen (c-kit) ; CKAE1/CAM5.2 = cytokeratins; D2-40 = a monoclonal antibody; H&E = hematoxylin-eosin; OCT 3/4 = a transcription factor; PLAP = placental alkaline phosphatase. Syncytiotrophoblastlike giant cells are the source of beta-hCG production; this protein expression is confirmed by immunohistochemistry. D2-40 membrane expression has been established in testicular seminoma  but has not been extensively explored in dysgerminoma. Gonadoblastomas are neoplastic proliferations found almost exclusively in patients with gonadal dysgenesis (pure or mixed), male pseudohermaphroditism, and Turner syndrome (45,XO and mosaics). More than 90% of patients with gonadoblastomas have a Y chromosome. Gonadoblastomas are histologically characterized by expanded nests containing Sertoli cells, germ cells, and granulosa cells admixed with variable amounts of hyaline. 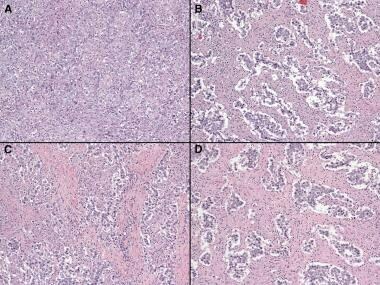 These nests morphologically resemble the Call-Exner bodies associated with granulosa cell tumors. Leydig cells may also be found within the interstitium. Characteristically, these neoplastic nests and/or fibrotic stroma between nests often contain large, irregular calcifications. Mitotic activity, cytologic atypia, and necrosis are minimal or absent. 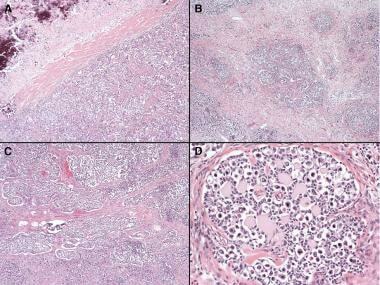 The following images depict examples of gonadoblastoma histology. Dysgerminoma and gonadoblastoma histology. A: Dysgerminoma with an adjacent zone of necrosis and large calcifications (×40). B: Gonadoblastoma with an adjacent dysgerminoma (×40). C: Gonadoblastoma with an adjacent dysgerminoma (×40). D: Gonadoblastoma (×200). Gonadoblastoma immunohistochemistry (×200). CD117 = a proto-oncogen (c-kit), ; CKAE1/CAM5.2 = cytokeratins; D2-40 = a monoclonal antibody; H&E = hematoxylin-eosin; OCT 3/4 = a transcription factor; PLAP = placental alkaline phosphatase. The prognosis and treatment of dysgerminomas are associated with their pathologic and clinical stage. The overwhelming majority (approximately 75%) of these tumors are limited to one or both ovaries (International Federation of Gynecologists and Obstetricians [FIGO] stage 1) at the time of diagnosis. Patients with stage 1A disease (ie, disease that is limited to 1 ovary) may be treated by unilateral oophorectomy alone, especially when fertility is to be maintained. The relapse rate ranges from 10% to 20%; the overall survival rate is 90-100%. Patients who suffer relapses may undergo chemotherapy; the survival rate for such patients is greater than 90%. Prat J. Germ cell tumors. 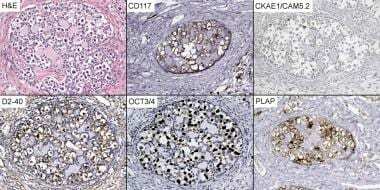 Pathology of the Ovary. Philadelphia, Pa: Saunders; 2004. 251-82. Talerman A. Germ cell tumors of the ovary. Kurman RJ, ed. Blaustein's Pathology of the Female Genital Tract. 5th ed. New York, NY: Springer-Verlag; 2004. 967-1034. Cao D, Li J, Guo CC, Allan RW, Humphrey PA. SALL4 is a novel diagnostic marker for testicular germ cell tumors. Am J Surg Pathol. 2009 Jul. 33(7):1065-77. [Medline]. Iacobelli JF, Charles AK, Crook M, Stewart CJ. NUT protein immunoreactivity in ovarian germ cell tumours. Pathology. 2015 Feb. 47(2):118-22. [Medline]. Song ES, Lee JP, Han JH, et al. Dysgerminoma of the ovary with precocious puberty: a case report. Gynecol Endocrinol. 2007 Jan. 23(1):34-7. [Medline]. 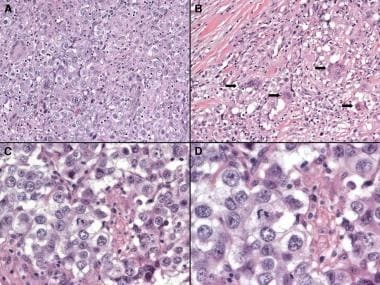 Tatekawa Y, Kemmotsu H, Mouri T, Joe K, Ohkawa H. A case of pediatric ovarian dysgerminoma associated with high serum levels and positive immunohistochemical staining of neuron-specific enolase. J Pediatr Surg. 2004 Sep. 39(9):1437-9. [Medline]. Evans KN, Taylor H, Zehnder D, et al. Increased expression of 25-hydroxyvitamin D-1alpha-hydroxylase in dysgerminomas: a novel form of humoral hypercalcemia of malignancy. Am J Pathol. 2004 Sep. 165(3):807-13. [Medline]. [Full Text]. Santala M, Burger H, Ruokonen A, Stenback F, Kauppila A. Elevated serum inhibin and tumor-associated trypsin inhibitor concentrations in a young woman with dysgerminoma of the ovary. Gynecol Oncol. 1998 Dec. 71(3):465-8. [Medline]. Yoshida M, Koshiyama M, Konishi M, et al. Ovarian dysgerminoma showing high serum levels and positive immunostaining of placental alkaline phosphatase and neuron-specific enolase associated with elevation of serum prolactin level. Eur J Obstet Gynecol Reprod Biol. 1998 Oct. 81(1):123-8. [Medline]. Gwin K, Cajaiba MM, Caminoa-Lizarralde A, Picazo ML, Nistal M, Reyes-Mugica M. Expanding the clinical spectrum of Frasier syndrome. Pediatr Dev Pathol. 2008 Mar-Apr. 11(2):122-7. [Medline]. Gucer F, Oz-Puyan F, Mulayim N, Yuce MA. Ovarian dysgerminoma associated with Pseudo-Meigs' syndrome and functioning ovarian stroma: a case report. Gynecol Oncol. 2005 May. 97(2):681-4. [Medline]. Koksal Y, Caliskan U, Ucar C, et al. Dysgerminoma in a child with ataxia-telangiectasia. Pediatr Hematol Oncol. 2007 Sep. 24(6):431-6. [Medline]. Rouzier C, Soler C, Hofman P, Brennetot C, Bieth E, Pedeutour F. Ovarian dysgerminoma and Apert syndrome. Pediatr Blood Cancer. 2008 Mar. 50(3):696-8. [Medline]. Michala L, Goswami D, Creighton SM, Conway GS. Swyer syndrome: presentation and outcomes. BJOG. 2008 May. 115(6):737-41. [Medline]. Marchina E, Gambera A, Spinelli E, et al. Identification of a new mutation in the SRY gene in a 46,XY woman with Swyer syndrome. Fertil Steril. 2009 Mar. 91(3):932.e7-932.e11. [Medline]. Guillem V, Poveda A. Germ cell tumours of the ovary. Clin Transl Oncol. 2007 Apr. 9(4):237-43. [Medline]. The author thanks Anet James for her graphical expertise and assistance with the images provided in this article.